One of the most popular search phrases that leads people to the Discard Studies blog is “pile of tires.” Perhaps the terrible charisma of piles of tires is why people search for the term on Google with such regularity? Is it the smell, the orderly stacking as the tidier version of hoarding, the mystery of vulcanized rubber’s permanence, the blurring of lines between industrial and domestic waste, or the memories from the 1980s and 90s of burning tires in the face of ozone depletion and acid rain that makes piles of discard tires such an icon? 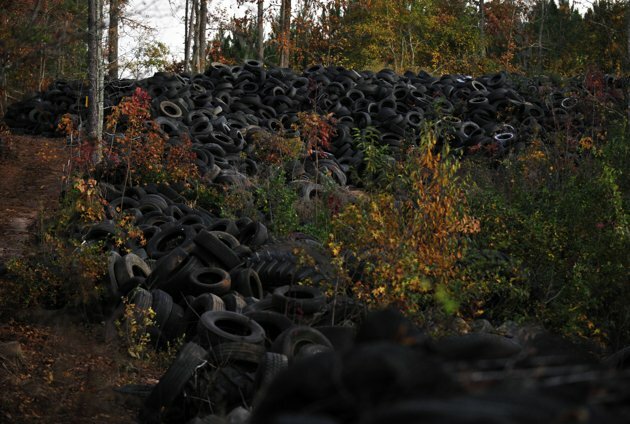 For those behind the Google searches, TreeHugger recently published a piece on a criminally massive pile of tires in rural South Carolina, where a man has accumulated 250,000 tires that occupy 50 acres of land. 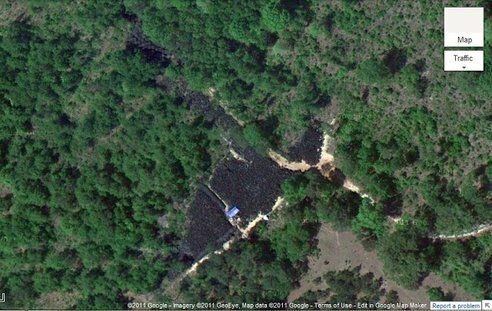 Michael Keitt, Jr’s pile of 250,000 pile of tires as seen in Google Earth. The tire pile was first brought to the county’s attention about a year ago. Under normal circumstances, the maximum fine for littering would be $475, but fortunately the state Department of Health and Environmental Control has taken over the case and is pursuing a case against an Easley, SC man, George Fontella Brown, 39 [the absentee landowner]. The charges of violating the state’s solid waste act carry four-digit fines and up to a year in prison. 1. a legendary [entity] combining features of animal, [waste] and human form or having the forms of various animals in combination, as a centaur, griffin, or sphinx. 2. any [entity] so ugly or monstrous as to frighten people. 3.any [entity] grotesquely deviating from the normal shape, behavior, or character. 4. a person or [entity] who excites horror by wickedness, cruelty, etc. Illegal pile of tires in Columbia, SC. Photo By Rainier Ehrhardt/AP. Oxford Tire Pile No. 1, Westley, California 1999, series by Edward Burtynsky. 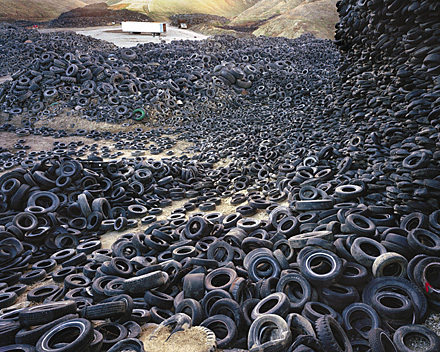 Edward Burtynsky, Oxford Tire Pile #9ab, Westley, California, USA, 1999. Chromogenic color print. Photograph © Edward Burtynsky, courtesy Nicholas Metivier Gallery, Toronto; Hasted Hunt Kraeutler, New York; and Adamson Gallery, Washington, DC. 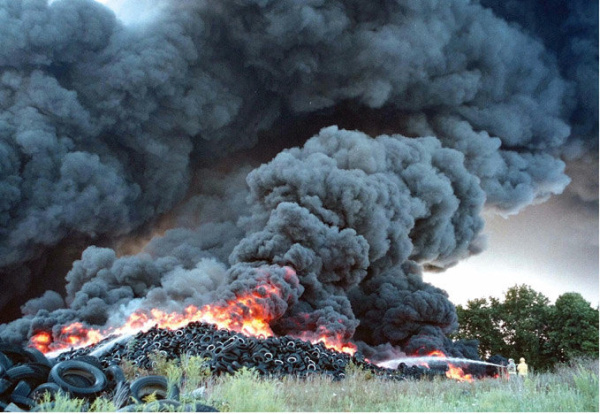 Firefighters battle a blaze at Kirby’s Tire Recycling in Sycamore, Ohio, Saturday, Aug. 21, 1999. Photo Randy Roberts/ AP. 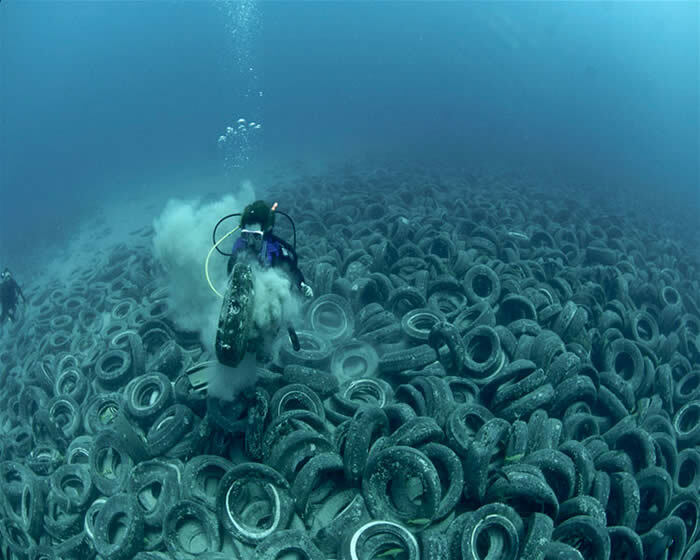 Tires on the ocean floor at Ft. Lauderdale, Florida. Photo Steve Spring. Max Liboiron is a PhD student in New York University’s Media, Culture, and Communication Department. This entry was posted in Recycling, Waste. Bookmark the permalink. They represent the excesses of the car industry. I think tires are an interesting symbol of the marriage of industrial excess, government subsidies for car culture (roads, mining raw materials, tax breaks), and how people become consumer-citizens as part of that marriage. In places like New York City, we can opt out of that arrangement because we don’t need cars to get to work. But in other places, there isn’t a choice, and people have to replace their tires and cars semi regularly. 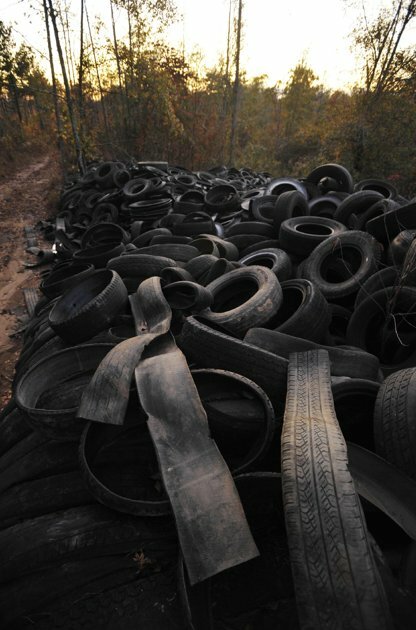 Unlike many other forms of waste such as plastic disposables, the responsibility for these piles of tires is often placed on government or industry, even though people face the same lack of options for plastic-free food as they do for having a car or not. Yes, they are not only related to the car but have broader implications. In this case in Spain, this pile of car tires was the key stone to articulate a project of panorama photos that linked piles of waste (scrapyards, landfills) with the real state bubble. You could see the building rising behind in the photo (this ones http://www.6000km.org/localizaciones/residencial-francisco-hernando-pau-el-quinon-y-autopista-de-peaje-radial-4/). Buildings constructed in this areas were mere speculative purposes were as waste a the landfills and could exist there because of the new highways and the car culture. A well connected ecosystem that make cities expand their boundaries hundreds of kilometers away. All of them are the consequences in the landscape and environment of the real estate bubble, what we called by then, “landscapes after the battle”.